Arizona Wildfires can start at any given moment, especially during the monsoon season. The Arizona desert may be filled with copious amounts of plants and wildlife, but every year, however, the beauty that makes Arizona so beautiful is actually its own enemy. AZ drought is a constant issue within the state of Arizona. The dryness of the desert, including the entire makeup of desert plants, are the perfect recipe for fires. Every year, too, is the strong likelihood that multiple wildfires will destroy vast acres of land in the non-metropolitan areas of the state. Not only have these fires devastated countless acres of land, these very same fires have created problems for both the natives of Arizona as well as for those not living in the state. In fact, they affect everyone as federal aid is sometimes needed to assist with the devastation. In addition, the air quality can be greatly affected and extremely dangerous with upper respiratory ailments. The polluted air caused by fires can easily drift for many miles and cause problems for those with lung issues. These Arizona Wildfires can also impact on the economy. Fighting these fires can be extremely costly, and obviously affect the revenue of not just the parks, but the surrounding businesses. Many of the businesses have had to close their doors for several days, sometime weeks, until the fires are no longer a danger to their business. 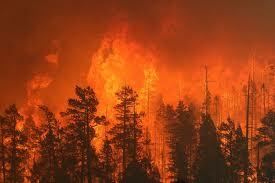 AZ Wildfires are generally caused by two things, the first being lightning and the other, by humans. Some humans are notorious for being careless when camping and neglect to put out their campfire, or at least completely. I sometimes see people throw out their cigarettes onto the ground and it always makes me so upset because I know that it just takes a spark for that cigarette to become the next huge fire! Lightning strikes generally occur during the monsoon, which is usually in early to mid July. With many families and individuals utilizing our Arizona parks, I feel we all need to be extremely careful to preserve the beauty of our Arizona desert so that we call continue to enjoy them for years to come.